It is important to realize that the type as well as the amount of each is a factor in good health. A weight loss diet should follow the same proportions as given above, but with a reduction in portion sizes. Carbohydrates in the diet should be mainly complex, naturally occurring carbohydrates, and simple sugars should be kept to a minimum. Simple sugars are monosaccharides, such as glucose and fructose (fruit sugar), and disaccharides, such as sucrose (table sugar) and lactose (milk sugar). Simple sugars are a source of fast energy because they are metabolized rapidly. * Starches, found in grains, legumes, and potatoes. * Fibers, such as cellulose, pectins, and gums, which are the structural materials of plants. Fiber adds bulk to the stool and promotes elimination of toxins and waste. It also slows the digestion and absorption of carbohydrates, thus regulating the release of glucose. It helps in weight control by providing a sense of fullness and limiting caloric intake. Adequate fiber in the diet lowers cholesterol and helps to prevent diabetes, colon cancer, hemorrhoids, appendicitis, and diverticulitis. Foods high in fiber, such as whole grains, fruits, and vegetables, are also rich in vitamins and minerals. Fats are subdivided into saturated and unsaturated forms based on their chemical structure. The fatty acids in saturated fats have more hydrogen atoms in their molecules and fewer double bonds between carbons atoms than do those of unsaturated fats (Fig. 16-2). Most saturated fats are from animal sources and are solid at room temperature, such as butter and lard. Also included in this group are the so-called “tropical oils”: coconut oil and palm oil. Unsaturated fats are derived from plants. They are liquid at room temperature and are generally referred to as oils, such as corn, peanut, olive and canola oils. Saturated fats should make up less than one third of the fat in the diet (less than 10% of total calories). Diets high in saturated fats are associated with a higher than normal incidence of cancer, heart disease, and cardiovascular problems, although the relation between these factors is not fully understood. Many commercial products contain fats that are artificially saturated to prevent rancidity and provide a more solid consistency. These are listed on food labels as partially hydrogenated vegetable oils and are found in baked goods, processed peanut butter, vegetable shortening, and solid margarine. Evidence shows that components of hydrogenated fats, known as transfatty acids, may be just as harmful, if not more so, than natural saturated fats and should be avoided. Figure 16-2 Saturated and unsaturated fats. (A) Saturated fatty acids contain the maximum numbers of hydrogen atoms attached to carbons and no double bonds between carbon atoms. (B) Unsaturated fatty acids have less than the maximum number of hydrogen atoms attached to carbons and one or more double bonds between carbon atoms (highlighted). Because proteins, unlike carbohydrates and fats, are not stored in special reserves, protein foods should be taken in on a regular basis, with attention to obtaining the essential amino acids. Most animal proteins supply all of the essential amino acids and are described as complete proteins. Most vegetables are lacking in one or more of the essential amino acids. People on strict vegetarian diets must learn to combine foods, such as legumes (e.g., beans and peas) with grains (e.g., rice, corn, or wheat), to obtain all the essential amino acids each day. Table 16-5 demonstrates the principles of combining two foods, legumes and grains, to supply essential amino acids that might be missing in one food or the other. Legumes are rich in isoleucine and lysine but poor in methonine and tryptophan, while grains are just the opposite. For illustration purposes, the table includes only the 4 missing essential amino acids (there are 9 total). Traditional ethnic diets reflect these healthy combinations, for example, beans with corn or rice in Mexican dishes or chickpeas and lentils with wheat in Middle Eastern fare. The need for mineral and vitamin supplements to the diet is a subject of controversy. Some researchers maintain that adequate amounts of these substances can be obtained from a varied, healthful diet. Many commercial foods, including milk, cereal and bread, are already fortified with minerals and vitamins. Others hold that pollution, depletion of the soils, and the storage, refining, and processing of foods make additional supplementation beneficial. Most agree, however, that children, elderly people, pregnant and lactating women, and teenagers, who often do not get enough of the proper foods, would profit from additional minerals and vitamins. When required, supplements should be selected by a physician or nutritionist to fit an individual’s particular needs. Megavitamin dosages may cause unpleasant reactions and in some cases are hazardous. Vitamins A and D have both been found to cause serious toxic effects when taken in excess. * Distinguish between unrefined and refined carbohydrates. 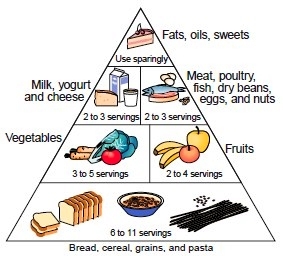 * Distinguish between healthful unsaturated fats, which can be eaten in moderation, and less healthful saturated and processed (trans-) fats, which should be restricted. * Accommodate vegetarians, who may avoid not only meats, but dairy products and eggs as well. * Specify portion sizes, which are smaller than most people think. * Include the need for water. * Indicate possible need for vitamin supplements. Governments in the U.S. and other countries will continue to study this topic with input from nutritionists and other scientists. The best nutrition guidelines, however, will be of no benefit unless people are educated and motivated to follow them. Alcohol yields energy in the amount of 7 kcal per gram, but it is not considered a nutrient because it does not yield useful end products. In fact, alcohol interferes with metabolism and contributes to a variety of disorders. The body can metabolize about one-half ounce of pure alcohol (ethanol) per hour. This amount translates into one glass of wine, one can of beer, or one shot of hard liquor. Consumed at a more rapid rate, alcohol enters the bloodstream and affects many cells, notably in the brain. Alcohol is rapidly absorbed through the stomach and small intestine and is detoxified by the liver. When delivered in excess to the liver, alcohol can lead to the accumulation of fat as well as inflammation and scarring of liver tissue. It can eventually cause cirrhosis, which involves irreversible changes in liver structure. Alcohol metabolism ties up enzymes needed for oxidation of nutrients and also results in byproducts that acidify body fluids. Other effects of alcoholism include obesity, malnutrition, cancer, ulcers, and fetal alcohol syndrome. Pregnant women are advised not to drink any alcohol. In addition, alcohol impairs judgment and leads to increased involvement in accidents. Although alcohol consumption is compatible with good health and may even have a beneficial effect on the cardiovascular system, alcohol should be consumed only in moderation.